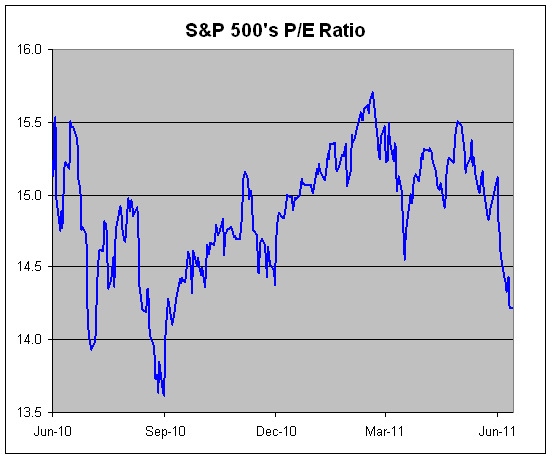 P/E Ratio of S&P 500 at 9 Month Low! Is It Time to Buy? S&P 500 of 1,891 Coming in 2012? [In] looking at the P/E Ratio for the S&P 500 going back to last June [in the chart below it is apparent that] the market’s P/E is the lowest it’s been in nine months. The market’s rally hasn’t been due to higher multiples, but mostly by earnings. In fact, at 14.22 times earnings, the market’s earnings multiple is still fairly modest. Put it this way, the S&P 500 averaged an earnings multiple of 16.94 from 2004 through 2007. Applying that multiple to Wall Street’s earnings forecast for 2012, gives us an S&P 500 of 1,891. There’s a lot of ifs involved in reaching that number, but I wouldn’t say that they’re unreasonable. The market continues to be overly worried about the future. Next Will the S&P 500 Rally or Fall Off a Cliff?